It's been a while since I last submitted something, but then again, it's been a while since I have last come to Minitokyo. There are works (of art) that requires much reflection and meticulous incremental steps in order to come to fruition, while there are others that just seems to naturally flow out and comes about spontaneously. This piece is of the latter. The general composition was completed in around an hour and another one and a half for fine tuning of the atmosphere, shadow editing, softness and final calibration to the 'camera'. The most time consuming aspect was the rendering due to its sheer size, complexity and the fact that I have an antiquity of a processor doesn't help much. Hence, it took over 24 hours to achieve the end result. 78 objects, 1 light, 1 procedural terrain. 4,820,842 polygons, spectral atmosphere, global radiosity and applied lens glare. The scene was entirely composed and render in Vue 6 Infinite. Oh, by the way, Vue 6 Infinite is awesome and I can't wait to get myself the seven version but it just too expensive and I need a new computer first. This is the first time that I have used spectral atmosphere and the first finalize work (there are a few more to come) in Vue 6 so all feedback and comments are very appreciated. The third, but not any less important point, is the scene of eagle flying in the dusk moment. 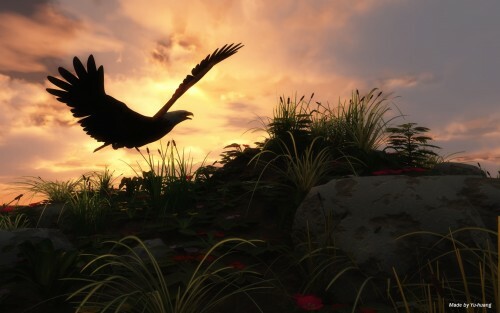 As far as I've seen in many images, most pictures of flying birds are depicted in bright daytime. Thus, this art piece is something new an interesting to me, in which furthermore, captures the sereneness of nature. Wow, haven't seen you in a long time! May I ask what image enhancing software did you use for this wallpaper? Did use Photoshop or other image software for this? so beautiful, I can't really discribe it. Anyway, you did a very good job. I almost thought it was a photo.